“Give mothers a chance !” – says Dr. Véronique Thouvenot while presenting the Zero Mothers Die project during the Fashion 4 Development First Ladies Annual Luncheon in New York, where the picture above was taken. At her side, another co-founder of ZMD, Jordi Serrano Pons. Dr. Véronique Thouvenot, the director of the WeObservatory and one of the co-founders of Zero Mothers Die, has recently spent an entire week attending numerous events in NY dedicated to global health challenges, mHealth and Women’s health (see previous post). The highlight of the week was the official launch of Zero Mothers Die by Michel Sidibé, Executive Director of UNAIDS, at the Women Leaders Forum inside the UN Headquarter during the 69th session of the UN General Assembly on September 22nd. 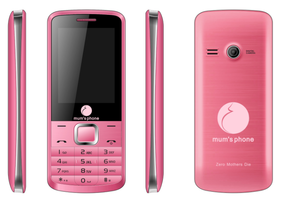 The Mum’s Phone, a unique $30 mobile phone designed for pregnant women, was launched as a key element of ZMD to highlight the need for technology to empower pregnant women themselves to access information and seek healthcare when needed. For a detailed summary of the event, please visit the ZMD official website. Accounts of this project were made by the Newsweek and UNAIDS. Help fund Zero Mothers Die campaign on Indiegogo and help spread the word!